The Museum of Latin American Art proved to be a perfect place for this South Indian wedding sangeet. With Moroccan decor provided by Raj Tents and Nikki Khan at Exquisite Events, the museum's exterior was transformed into a colorful wonderland. The bride was decked out in green and red, which looked glorious next to the orange draping of the tents and the Moroccan-themed tent interiors. Guests loved the traditional South Indian dancing, which was precise and mesmerizing. This lovely couple had two wedding ceremonies, as they each hailed from different regions and had different religions. The first ceremony took place the day after the sangeet, at the Walnut Gurdwara. The Sikh ceremony was lovely, and the groom's relatives delighted in celebrating their faith and the union of these two sweet souls. The second ceremony took place the following day at the Huntington Beach Hyatt, which boasts ballrooms that can hold upwards of 600 guests. 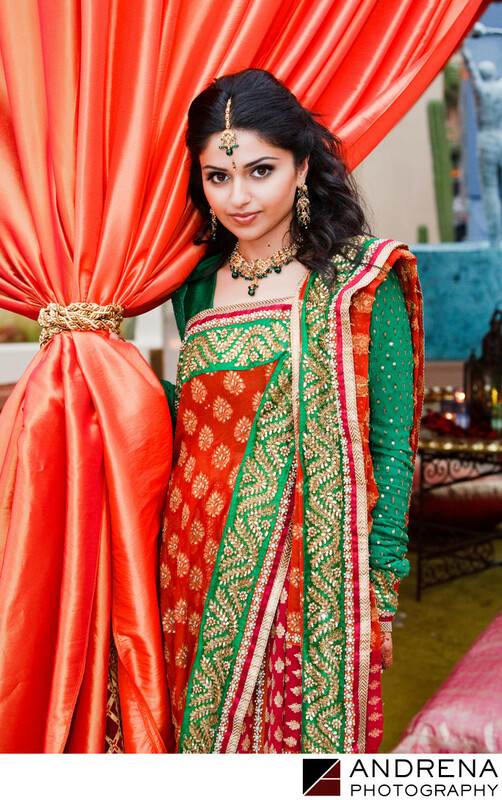 The Hindu ceremony took place under a custom mandap, with florals provided by Nisie's Enchanted Florist. South Indian wedding photographed at the Huntington Beach Hyatt in Huntington Beach, California. Sikh wedding ceremony photographed at the Walnut Gurdwara in Diamond Bar, California. Sangeet photographed at the Museum of Latin American Art in Long Beach, California.